Communication Packages | Dragonfly Pictures, Inc.
DPI UAVs include a high-bandwidth encrypted communications link. Our UAV can also carry a variety of communication payloads to meet your industry’s mission requirements. With stable hover, autonomous launch and recover, and long endurance, these UAV provide a long distance comm link over land or sea. Autonomous UAV can follow a group, land on high ground, and provide a remote comm link, then self-start, self-launch, and continue to follow the group the next day. Remote comm links are useful for survey groups, expeditions, power line assessment, search-and-rescue, fire fighting in wildland areas, forestry workers and other mobile or remote groups in rugged or remote terrain. At sea, mobile communications can provide live cinema-quality video across the encrypted, high bandwidth comm link. Or provide extended communications for fisheries, supply tenders, and search-and-rescue operations. Our smaller, electric UAV, the DP-6XT Whisper, can be tethered up to 200 feet to provide an encrypted comm link 24/7. The Whisper offers a virtually maintenance-free design due to the electric motor. For information about comm packages available for integration with DPI UAV, or for information about integrating your communication package on your UAV, contact DPI. 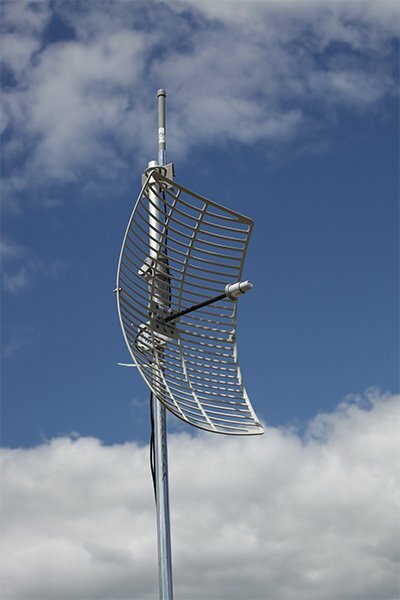 Data links provide state-of-the-art, high-bandwidth wireless communication, including ground-based reference stations for extending comm range. Aerial comm relay, mobile or with stable hover in crosswinds to 40 kts. Ground comm relay with intelligent landing site selection, self-engine shutdown, self-ignition, self-launch, and autonomous flight to a new location. “Following” aerial relay up to 500 feet altitude, tethered to a mobile ground or surface (water) vehicle. All DPI UAV include Iridium Satcom* communication, for high bandwidth, encrypted communications. DPI can also integrate your communication package on our UAV or your own aircraft.